One of the most popular posts on this blog has been, and still is, my “Top 10 Augmented Reality Devices“. Based on the feedback, you appreciated the condensed collection of various categories of devices, as well as the suggested criteria for evaluating upcoming devices. What you were missing is a practical head to head comparison of the top devices. 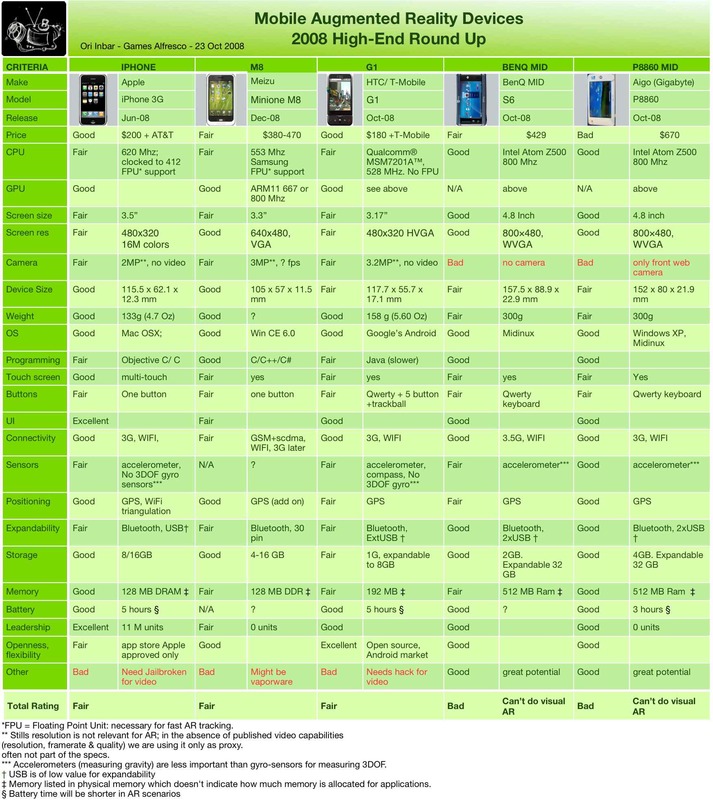 So ,here it is: the (mostly) complete, (roughly) unbiased, and accurate (at best) comparison of the top mobile devices for high end augmented reality. How do you become a high-end AR device? If you’re snug in my hand, have the power to track natural features and objects in live video, while interacting with the overlaid 3D graphics at 24 fps — and all looking good on the display – welcome to the high end club. Now, take a deep breath, click…and dive right ahead: 5 devices, 22 criteria, rated from bad->fair->good->excellent, with no frills. Have you seen any better high end device? Should Nokia sneak up there? What would you like to see next on the list?